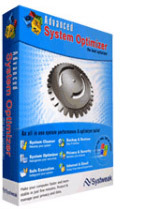 Advanced System Optimizer v2 is a powerful, easy-to-use system performance and optimization suite. Its 30+ tools let you supercharge your PC's performance. You can enhance your security, beautify and optimize Windows, tweak Windows settings, customize your screens, and make Windows work the way you want it to. Considering the view point of a business person who wants his copy of Windows is optimized for smooth functioning of daily use applications, a home user who wants to improve system performance and postpone purchase of new machine, a network administrator or a computer consultant who investigates and rectifies performance problems on users' computers and all other guys who are concern about their data security and system performance, Advanced System Optimizer has that all. Advanced System Optimizer v2 includes more than 30 tools for supercharging your PC's performance, and more than 200 tweaks for customizing Windows and improving its performance. Optimization tools help you to get the best output from your PC. These include tools like Memory Optimizer, Windows Optimizer, Advanced Direct Email, Registry Defragger & Optimizer. By making your computer run more efficiently, you'll save time and be more productive. These tools help to improve system settings & optimize your system performance. These include tools like Repair & Fix Zip Files, Split & Join Files, System Analyzer, Safe Uninstaller, Logon Settings, and Files & Folder Information. Now it's easy to find out what's on your computer, and to manipulate files to meet your needs. These tools remove junk from your PC, keeping your machine error-free. These tools include System & Disk Cleaner, Registry Cleaner & Fixer, Find Duplicate Files, and Start-Up Cleaner & Auto Run Manager. By removing unwanted files from your hard drive, your computer will be faster and more stable. Protect your privacy and secure your sensitive information from prying eyes. These tools include Ad & Pop-Up Blocker, Secure Sticky Pad, Privacy Protector, Spyware Detective, Block Programs, and Encrypt/Decrypt Files & Folders. Instead of buying separate, expensive programs, get top-shelf utilities bundled in the Advanced System Optimizer package. Maintenance tools include smart utilities like Backup Files & Folders, Email Notifier, Appointment Planner, System Files Back Up & Restore, and Media Files Organizer. These programs enhance your system's performance, and simplify your work. These include tools like Task Bar Manager, Wallpaper Changer, and Icon Manager for getting the best look for your PC. Make Windows look the way you want it.